‘Tis the season to be jolly, so put away your holiday shopping list (just for a few hours!) and step away from the computer. . . it’s time to get the family out to enjoy the holiday season! The 14th annual Lone Star Christmas event, presented by FUJIFILM INSTAX® will offer a variety of festive holiday activities, exciting live entertainment and grand displays to celebrate the most wonderful time of the year. Chinese ice artisans travel halfway around the world to Grapevine, Texas to hand-carve 2 million pounds of ice into magical holiday scenes, brilliant characters, an “On the Blocks” ice bar (21 & up) and five two-story tall ice slides. 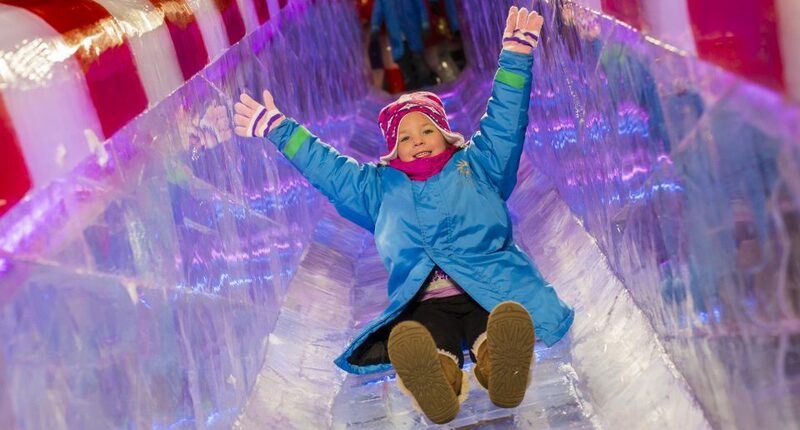 Other holiday activities will include a 12-lane snow tubing hill, Build-A-Bear Workshop® Scavenger Hunt, gingerbread decorating presented by Hallmark Channel’s Countdown to Christmas and an outdoor ice skating rink, just to name a few! True, it’s a bit of a drive, but it’s also a long winter break. Sharpen your skating skills at Panther Island Ice. Fort Worth’s only outdoor skating rink remains open 7 days a week, including all holidays. Even though Texas isn’t known for outdoor winter sports, Panther Island Ice is a cool way to make the most of our short winter season. Celebrate the season at the 9th Annual “A St. Andrew Christmas.” This year’s concert, titled “Christmas Carols from the Aspen Grove,” will be all music, featuring internationally acclaimed British vocal ensemble VOCES8, the St. Andrew Chancel Choir, the Salt and Light Youth Choir, Children’s Choirs, a 45-member professional orchestra and the magnificent Létourneau pipe organ. Tickets range from $10 to $20. You won’t need to see it at Rockefeller Center because Tuba Christmas is coming to Watters Creek for one exclusive night of FREE musical entertainment. Chamberlain performing arts’ production of The Nutcracker features New York City Ballet principal dancers, Tiler Peck and Tyler Angle. December 1-2, 8-9, 13-16, 18-23. Make your holidays sparkle with fun family-filled events at Watters Creek at Montgomery Farms in Allen. Your Holiday Spirit will start to twinkle with the LIGHT THE NIGHT event. There will be caroling, carriage rides, crafts and Santa, as well as a dazzling interactive light show with over 145,000 glimmering lights synchronized to favorite holiday tunes as well as a spectacular fireworks show to cap off the night. Walk and wind through the 12-acre park, with millions of sparkling LED lights that are wrapped around more than 550 glittering trees. Once the switch is flipped at Vitruvian Park, lights remain on each and every evening through January 1 for a holiday stroll. Take a stroll along candlelit paths and experience gleeful carolers, holiday storytelling, hand-weaving, blacksmithing and craft-making. The Dallas Heritage Village features over 600 candles lighting the path, as well as an American Flyer model train exhibit, surrey rides and more. All proceeds benefit museum programs at Dallas Heritage Village. This trampoline park is a perfect family fun day. Everyone will enjoy full access to the entire park, including the main court, foam pit, battle beam, trapeze and dodge ball courts. And, teens love Teen Night on Saturdays from 8PM-11PM ($17.25) and Friday Night Friendzy each Friday from 7PM-10PM ($17.25 and includes a pizza). It’s an awesome party venue, too. Texas Karate Institute is putting on Winter Fun Martial Arts Camps this holiday season. These fun and dynamic Self Defense & Martial Arts Skills Camps will promote and build character and core life values in an exciting and dynamic format. These camps are open to any skill level including first time martial art students. From private, intimate gatherings to large-scale events, Bash puts a unique spin on your event using theme, invitations, venue, menu, props and decorations, logistics, party favors, staffing and attention to every last detail. Bash provides turn-key, full service or “just a bit of help” where needed to have the perfect Bash. Party Time Texas is Dallas’ top source for party entertainment. The legendary Bill Cody and his tenured team of DJ’s, MC’s and entertainment specialists make every fete more festive. DJ’s come equipped with incredible sound, spectacular lighting and extensive music library (including special “clean edits” of top 40 hits). From special requests to games and activities, they will customize the music presentation to fit your age group, theme or occasion. Need more? Look no further! This is a one-stop resource including bands, dancers, photography, videography, instant photo stations and whatever it takes to bring the wow to your special event. Are you ready for the holiday season? It’s time for festive parties and cheerful get-togethers with friends and family! Whether you’re planning an elaborate Thanksgiving meal, organizing a holiday school dance with your PTA or hosting your annual office Christmas party, GigSalad.com is a one-stop shop for booking entertainment. They understand the struggle to find the event vendors you need. With that in mind, they created a booking platform that’s simple to use and offers over 600 categories of entertainment and event services! Find local DJ’s, cover bands, magicians, face painters, caterers, photographers and more. You can even find unique holiday entertainment like Santa Claus, flair bartenders, Christmas carolers and mariachis! Browse tons of photos, videos and reviews to make sure you’re getting just what you envisioned. Once you’re ready, you can request a free quote from as many vendors as you’d like. And when you book, you can do it with confidence. Their platform is secure and offers a worry-free guarantee that ensures a refund if anything goes wrong. Their Customer Happiness team is always ready to help, too. Santa Arrives to Light the Night!